Liberal Activists Hand Out Literal Fake News in Washington D.C.
Liberal activists handed out fake copies of the Washington Post Wednesday and even set up a website mimicking the paper. 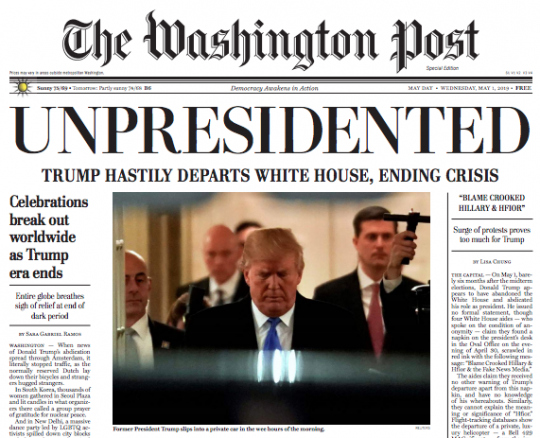 The fake paper dated to May 1, 2019 has the blaring headline "UNPRESIDENTED" and purports that President Donald Trump "appears to have abandoned the White House and abdicated his role as president," to worldwide celebration. The activists in question also created a fake Washington Post website that is nearly indistinguishable from the actual website except for the fake headlines and a different slogan, "Democracy Awakens in Action." "There are fake print editions of The Washington Post being distributed around downtown DC, and we are aware of a website attempting to mimic The Post’s," the paper said in a statement. "They are not Post products, and we are looking into this." Liberal activist organization MoveOn was on the scene of the fake papers being handed out in front of the White House. While the organization pushed the fake paper on social media, they later sent out a tweet denying they produced it. While we love the headline, we didn't produce today's satirical Washington Post. Later Wednesday morning, longtime liberal activist L.A. Kauffman, liberal author Onnesha Roychoudhuri, and self-described " trickster activist collective" the Yes Men took credit for the paper. "The story this paper tells is more reasonable than our current reality," Roychoudhuri said. "And it’s anything but far-fetched. We’re already seeing unprecedented levels of protest and resistance. Now we just need to ask ourselves: What’s next? This paper offers a blueprint to help us reclaim our democracy." Kauffman also posted a tweet showing herself handing out the fake papers. She is listed as the editor of a pamphlet that appeared on the fake website calling for mass action against Trump. This entry was posted in Politics and tagged Fake News, Washington Post. Bookmark the permalink.